Today I did all the things I tell my children not to do. Today I said things I should not have. Today I did what I determined I would not do. Today I did what I know I shouldn't do. I don't like messing up... I don't like being wrong. I agonize it over in my mind how I could have done things differently. If only I had done it this way. Why did I have to go and do that!? I know I am not alone, I know that you also struggle, that you don't always live a perfect life; that you don't always do what is right. This gives me some comfort but it is still hard to admit that I don't have it all together, that I am not always a good example to my children; that I am just plain stupid and irresponsible at times. We all have those days that we would just rather forget about and act like they never existed. We thank God that our mistakes and foolishness didn't end up as bad as they could have and like an ignorant child, promise to be better and never mess up again. Of course this is impossible... we will never be perfect; never get things just right. We will hopefully learn from our failures and mistakes but there will always be new messes to get ourselves in to...there will always be our flesh to fight. Even though I know this is true I somehow fool myself into thinking that tomorrow I wont mess up. Yes, tomorrow is full of hope, hope that we can have another chance at doing things better. You know you do it too, you take mental notes of those people that you don't want to be like and those attributes you don't want to be associated with. You try to learn not only from your mistakes but your peers and hopefully become a "better person". I love looking back each year and seeing how I have grown. I pat myself on the back, congratulating myself that I am not like that anymore. "I used to be so narrow minded and look how I have changed! I can't believe I use to think and act that way! Boy was I immature!" I honestly am thankful for the areas I have grown and matured in, it wouldn't be right if I didn't see any growth. The problem is, there is always going to be an area in my life to overcome; a difficulty to face, a bad habit to change. But no matter how hard I try to do what is right, I determine to be perfect, I promise to never do that again...sin will be right there with me...and I just can not defeat it on my own. I will never be good enough, strong enough...no matter how hard I try. This is where Jesus comes in; he does what I can not. He points me to the cross and reminds me why he died on it. Because only he is perfect, only he is able to take upon himself the sins of the world, only he could take my imperfections and mistakes and wash them clean and forget about them as if they didn't exist. He invites me to daily come to him and admit my wrong doings; to be transparent and vulnerable before him. As a gentle, loving Father he shows me where I am at fault, corrects me and then puts it completely behind him, never bringing it up again. 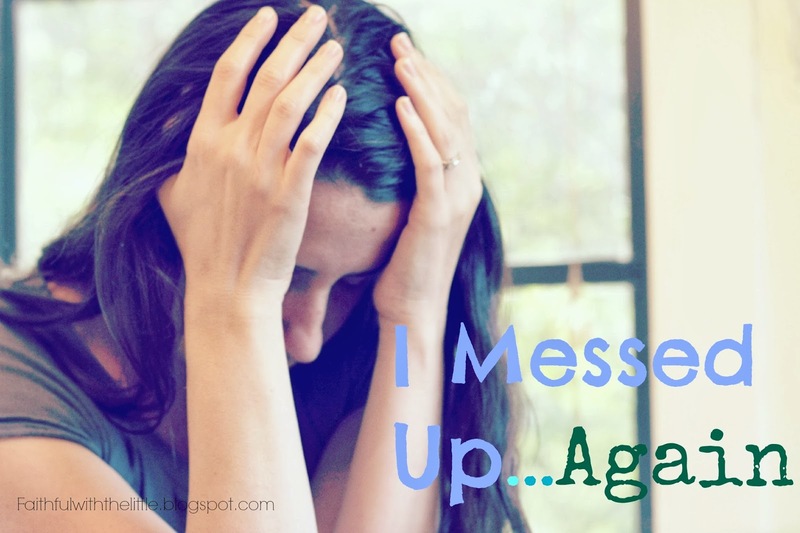 Unfortunately, I will mess up... again, but that's okay because I know that Jesus will be right there when I do. "Now if I do what I do not want to do, it is no longer I who do it, but it is sin living in me that does it. So I find this law at work: When I want to do good, evil is right there with me. For in my inner being I delight in God's law; but I see another law at work in the members of my body, waging war against the law of my mind and making me a prisoner of the law of sin at work within my members. What a wretched man I am! Who will rescue me from this body of death? Don't be so hard on yourself! 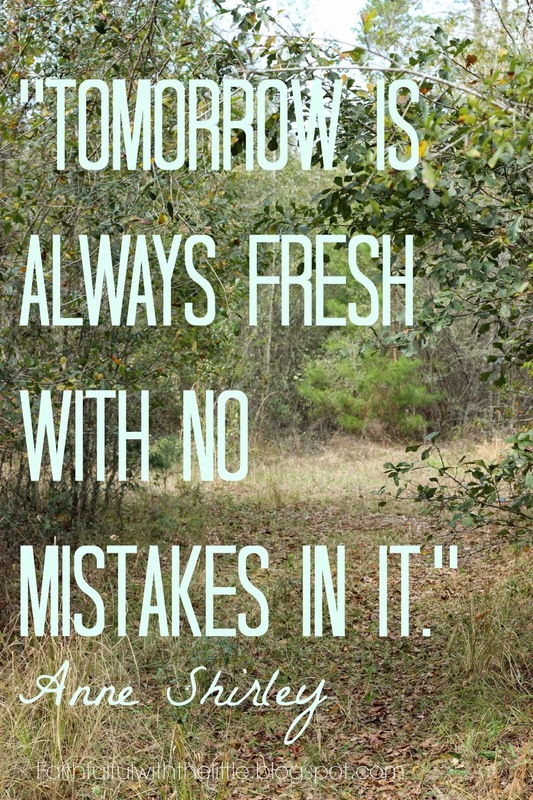 We all make mistakes, but there is tomorrow, and God forgives and your kids will love you! Found you via Mommy Moments! Yes there is tomorrow! God's grace and forgiveness is always there! But I think God puts a desire in us to be perfected, so I look forward to that day when we will be made like him! Visiting back from Diamonds in the Rough. Thanks for coming by!! !